All you have to do is leave your first name and last initial in the comments section and enter by Tuesday, April 14 at 11:59pm EST. i just got my postcard save-the-dates in! i used a vintage pic of my town in it and it turned out great! i used nextdayflyers, though. i'm super excited about them but can't send them out for a couple more months, since the wedding's still a year out. good luck to whoever enters! This is great! 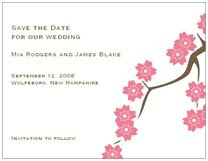 I've been looking around for places to print my save-the-dates & everyone recommends vistaprint. Ooh, we're planning on doing VistaPrint postcard invites anyhow so this would be wonderful! Ooooh! I'd really love to win this since I was already planning on doing postcard STDs! Wow, that would be awesome! Great contest. i printed my savethedates at VistaPrint as well as a set I designed for my also-engaged roommate...and they turned out great! 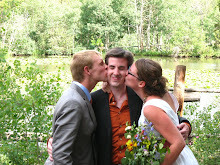 i'd love to print some thank-yous with a pic from the wedding!! Very Fun! Love the Blog, its been keeping me sane. 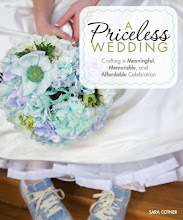 OMG we were totally going to make vistaprint save the dates, but I was dithering on it bc the price is a little steep! oh yes- and their sales change quite a bit as well- the invitations we were looking at were 8.99 for 10 one day, and then 6.99 the next. plus, if you order more, it gets cheaper. we spent $35 on 100 invitations. definitely worth it! This is a great contest! 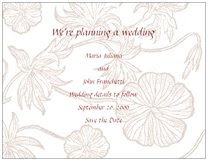 Like some of the other ladies, I was going to use vista print for some of my wedding-related paper needs! How exciting! Very cool! Thanks so much for doing this! This would be perfect for our October Wedding. Lucky for me I have a fantastic friend who has been working up some rockin' designs, just need to print them somewhere! I just got engaged and am very inspired by this website! I hope I win! Great contest! And it has inspired me to leave my first comment. What can I say, I like free stuff. Ooh! Such a great offer! I was planning on using Vista Print anyway, so this would be perfect!! Erica P.
Amanda H. Memorial Day weekend Save The Dates should go out really early, right? This is so GREAT! My fiance and I are still in school (aka: small budget) and this would be such a blessing! Wow, I am amazed that with all the invitations/S-T-D stuff I have looked at this is not something I had already run into. I'd love to use these for thank you cards, how cool! That's awesome. 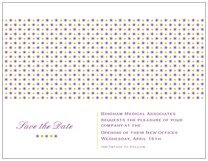 I was just on Vista Print yesterday trying to find which template I wanted for my Save the Date postcards! What are the odds? I love Vista Print. I am always on the site looking the designs and options! Nice contest! I'm sure I'm not the first to notice the incredibly awkward acronym these mailings make. Should we all really be sending out STDs??!! Also, if anybody else is looking for recycled paper postcards, Save a Tree printing is easy to use and only a little more expensive. I'll let you know how they turn out! i love vista print designs! this would be a huge help for our budget wedding. What a great opportunity to say how much I love your blog! I've been reading/subscribing for a while. Very nice work! Thanks for putting up this contest. This is awesome, I wonder why there are not more contests like this! I've been thinking about using VistaPrint so this would be perfect! Oh please pick me! 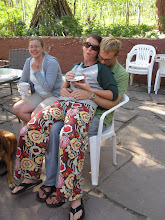 I have been dreaming of doing postcard save the dates but cant afford it :( I would be the happiest contest winner ever! I just got my postcard save-the-dates in the mail from Vistaprint. because of this post I visited vista print and how cool! I am able to upload all of my artwork (i'm an artist and art teacher) that I wanted to incoperate in my invitations and save the dates. What a great contest to offer. Such a great giveaway!!! Woohoo! I would totally use them for RSVP cards since I just used them to print out postcards and magnets for Save the Dates! I'm using vistaprint anyway, but free is always better! I just received my VistaPrint invitations. They are doing a promotion right now! 100 postcards for free(you only have to pay shipping!). They are lovely! OH OH Pick me pick me!!! I am making postcards for our invites.... this would be awesome! great idea, hope i win!!!! Lucy G. Hope I win! my checkbook would be very excited if I won this! 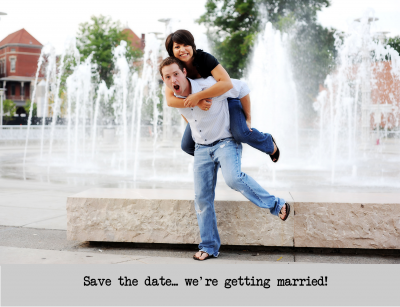 Great contest -- I'm designing my Save the Dates now! Thank you for the wonderful contest. I already know the style I would have. 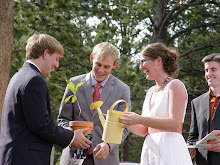 We're planning our August wedding- to be held at a VW car show in Eureka SpringS, AR.... AND ON A NON-EXISTENT BUDGET. Your blog has been an inspiration. Thanks!